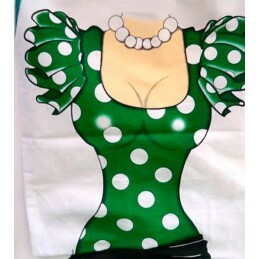 Flamenco Spain There are 60 products. 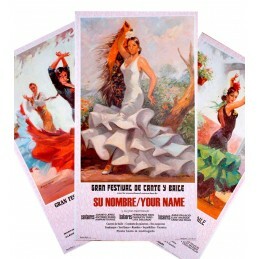 Souvenir shop and flamenco articles, next to the Plaza de Toros de Las Ventas in Madrid and shop online. 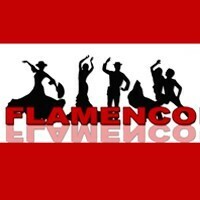 Whether your shopping for flamenco products, we have a variety of articles flamenco fans, accesories and complements, shoes, dance costumes for girls, castanets, mantillas, dvd, etc. Creaciones Nadal sculptures stand out for their creativity, perfection and beauty of the pieces. This is dedicated to flamenco dancers. These pieces are limited edition (marked with serial number and certificate of authenticity). They are available in black,red or in white. They measure 3.9'' high. Flamenco dancer costume for girls available in black and red with dots and ruffles. The body is made of 100 % polyamide and skirt is 100 % polyester. We recommend to wash it in cold water and iron at 30 °C. The flamenco dance costume is available in eight different sizes: from 0 months to 14 years. 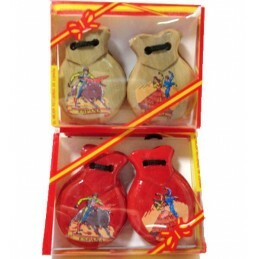 Decorated wooden castanets flamenco dancers for children and adults who start practicing. 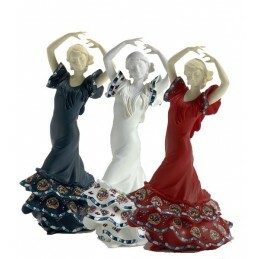 A typical Spanish gift, nice souvenir of Spain.Available colors: red, black and natural wood.